Normally, MuzikDizcovery doesn't cover metal releases. 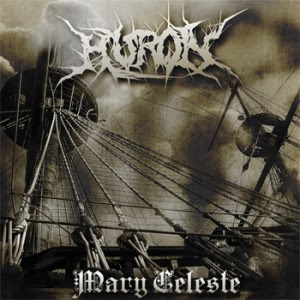 However, with the quickly rising, Plymouth-based band Huron, we were asked to take a look, and after listening to Mary Celeste, I was all too excited to write something. A smooth blend between the harsh 90's thrash metal scene and the older, rowdy rock 'n roll style, Huron is the definition of heavy metal, with powerful shout-style vocals and facemelting riffs even the pickiest of metalheads could enjoy. The title track of the album is a grooving testament to how hard Huron can hit. A fast, headbanging melody in two rumbles along like a fast moving earthquake as vocalist Sean Palmer screams, "She was dragging me down in her embrace / Tried to break free, it was too late / I never saw the devil in her eyes / Singing death's lullabies", referring to the mysterious sinking of the Mary Celeste. One of the most interesting tracks due to the nonfictional content of the lyrics, the lead-in to the solo is a fantastically constructed half-time breakdown, followed by a great work of arpeggios and harmonic minor by Neil Sims in the solos, that would only have been better if it were longer. A relaxing break from all the brutality, "Eternal Sea, Pt. 1" is an unplugged tribute to HMS Ardent sailor John Goddard, which was sunk in the Falkland Sound on May 22, 1982. Palmer refers to this when he softly croons, "Ardent sleeps / Under her cold dark blanket / She creaks and moans / I'll always defend her honour", in homage to the sunken ship. The song is an acoustic ballad primarily in F, with mostly just one acoustic playing through the song. However, there is a very technical, very melancholic acoustic guitar solo over a power-chording acoustic and a choir of sad voices harmonizing, right before an acoustic outro and soft whispers by Palmer, "She will rise again and so will I / I'm with my brothers now / My pain has gone as they embrace me / I will see you again my love / I will be waiting on the other side", and is a beautiful testimonial to a fallen man. There was as much research done to compose this album as there was to write a review about it, and post-listen, I'm still reeling as to how much creativity went into what, on the surface, seemed like just another metal album. The combination of interesting subject matter and the well composed metal to back it up, this album is like reading a world history textbook while blasting some Godsmack. It hits pretty hard with every second, and I think my only complaint was the tone of the guitars, but that was easily ignored after I was immersed by the sheer force brought on by the technical skill and the lyrical quality. Fans of metal are going to find this an easy listen, I haven't any doubts about it at all. You can check out Huron on the band's MySpace and on the band's own website.